Well, this summer bug continues, though (hopefully) it's on its way out. It led me once again to the doctor's office earlier this week, where, in the waiting room, I perused a magazine for women in their 40s. Yes, a magazine especially designed for my middle-aged female counterparts. I felt bad. For them..and for me. 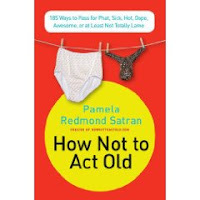 In the magazine I came across an excerpt from a popular book making the rounds: Pamela Redmond Satran's "How Not to Act Old." It was both humorous and depressing, practical and disorienting. What it made me realize is that a) I guess I really am getting old; and b) there are specific ways to combat this besides the usual middle-aged male mistakes. I learned things like: 1) don't wear a watch (younger people never wear watches; they simply consult their cell phones); 2) emails are for old people (young folk always text, IM, or "facebook"--a verb!--their friends); 3) when texting, never use your index finger (hip younger people always use their thumbs); 4) when calling someone on their cell phone (itself a sign that you're old--see #2), never leave a message (young people apparently don't listen to their voicemail, or, if they do, never return your call anyway); 5) instead, dial and hang up without leaving a message (then your younger friend, seeing your number, will call back immediately, thinking that your call presages something either so great or so dire as to merit a call-back). I write all of this with tongue held firmly in cheek. However, what it does indicate to me is that the rate of change--particularly that inspired by technological advancement, is accelerating right before my eyes. To think that emails have gone passe and with them voicemails and watches--all due to Twitter, social networking sites, and texting, and all of it within the span of literally months, not years--makes my head spin. My parents' generation (let alone mine) are quickly getting left behind. The communication gap is growing exponentially and it makes me wonder if the generational divides (and any consequent communication breakdown) will only widen and worsen. Will we lose the ability to connect meaningfully between age groups? What will be the net effect for families--and church families in particular? One encouraging note: yesterday, at a birthday picnic in the park for some church friends, my teenage son purposely left his cell phone behind--and I had the joy of watching him play with his parents' buddies and their kids--uninterrupted by texting and other technologies. It can happen. But not without effort. Just wait, Carl! You have MUCH more to look forward to. Each morning while I'm reading the (yes, hardcopy!) newspaper, the last thing I look at is the "Celebrity" section. Fact is, I might typically recognize the names of - maybe one or two of these people. Remembering when my folks didn't know many of the celebrities or musicians that I thought EVERYONE knew as a child/teenager, I now recognize that I'm in true 'old age'. But, there can be a certain freedom and comfort in living into your life cycle. Once you get over it and just accept that you are moving on, there is so much beauty and peace in 'this stage of life'. Aaaaahhhhh.........one of God's many good gifts. Thanks for visiting and for leaving your comments--from two very different perspectives! I hope to navigate these age & stage waters with grace and good humor. Folks like you help with that. I'm reading in reverse order, Carl...I saw this magazine article, too, though I confess I'm rebelling and keeping my watch, no matter how passe it looks (easier to glance at!). But I had the epiphany about e-mails not quite two years ago, as I was teaching an MA comm theory class at CU. No one under 25 was regularly using e-mail other than to communicate with their professors, or maybe parents, some of whom still felt they were hip to be online! But it was still the lingua franca for anyone in their late 20s & 30s. Fascinating. I've been on Facebook now for about 16 months, and indeed, my own mediated communication world has changed drastically as a result, in that short time. Much of what I used to do on e-mail now happens on Facebook, and largely because of the network aspect, and the ease of sharing multimedia (esp. photos) and links - to articles, YouTube videos, etc. It has, I daresay, exponentially increased the amount of communication I am doing -- which I love, yet which encroaches on other elements of my life,too, such as solitude, contemplation, and time in the outdoors. I am thinking a LOT about all this lately, as clearly are you! It's interesting to be our age, on the cusp, really, of such big change. We are racing to keep up (it's second nature to Jason & Kjell), yet most people our parents' age aren't even trying...or even aware of what all these terms mean! As for the church, while on the one hand it's important to stay abreast of new communication means, I think that authentic, face-to-face interaction will become even more crucial - and meaningful - as our technological immersion grows. Thanks for prompting yet more thinking on all this! When I call people and talk to them on the phone, we keep in touch on a personal level. When I write a note, letter or card and there is a personal connection. When I visit directly with someone, we have a personal connection. Everyone is aching for personal connection. Unfortunately they think it will happen with all the new "instant" messaging. But I doubt that it even rarely happens. People need people. There is no substitute for the real thing. Technology is amazing and fun, but I will take take "face to face" over "Facebook" at any time. Well put, Suzi. I resonate...the trick is to use more instant methods to allow us (as appropriate) to connect at deeper levels (face to face, phone, written letters, etc). We certainly can't substitute easier and faster methods for those more tried and true. At least that's my opinion for now! Thanks for visiting.